The global steam boiler systems market is highly region-concentrated with a strong presence of key players in their home regions, finds a new study by Transparency Market Research (TMR). At the global level, the market is led by Alstom, General Electric, Cleaver - Brooks Inc., BHEL, and Larsen & Toubro Ltd., which collectively held a share of more than 46% in the overall market in 2015. The leading players are actively involving into mergers and acquisitions, which is anticipated to increase the competition within the market over the years to come. According to the TMR’s report, the global market for steam boiler systems offered an opportunity worth US$12.0 bn in 2015. Analysts project it to swell at a CAGR of 5.30% during the period from 2016 to 2024 and touch US$8.9 bn by the end of the forecast period. In terms of sales volume, the market is likely to cross the 244,836 units mark by 2024. Water tube boilers have emerged as the most valued products in this market and are anticipated to remain so over the next few years, thanks to their extensive usage in large power plants. The worldwide market for steam boiler systems is spread across Asia Pacific, the Middle East and Africa, Latin America, North America, and Europe. In this research report, an exhaustive assessment of this market on the basis of its geographical presence has also been offered. According to the study, North America led the global market with a share of more than 30% in 2015. Researchers expect this regional market to hold its dominance throughout the forecast period, thanks to mushrooming food processing facilities, chemical manufacturing units, power plants, and oil and gas refineries across North America. Apart from this, the surge in the commercial and residential application of steam boiler systems is also projected to boost the North America steam boiler systems market in the years to come. 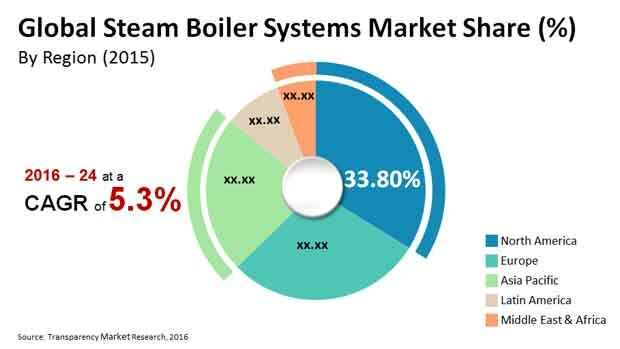 Among others, Europe and Asia Pacific are likely to witness a healthy progress in their respective markets for steam boiler systems in the near future. The presence of established manufacturing industries in a large number is expected to drive the Europe market for steam boiler systems while the Asia Pacific market will be led by the proliferating industrialization and them augmenting demand for energy in developing countries, such as China and India, over the forthcoming years, notes the research study. “The tremendous rise in the demand for energy across the world is having a significant impact on the uptake of steam boiler systems, which consequently, is reflecting greatly on the global steam boiler systems market,” says a TMR analyst. The fact that steam boiler systems are highly effective in enhancing the productivity of a power plant has bolstered their demand, which is expected to remain growing over the forthcoming years. In addition to this, the increasing government initiatives, intended to encourage the usage of steam boiler systems, such as offering rebates and subsidies on their purchase, is likely to add substantially to this market in the near future, However, the high initial and maintenance costs of these systems may restrict the progress of this market to some extent over the coming years, states the research report.